If this is a sharp correction before a secular finale for gold, then there is a potential mirror from history in the Nasdaq. 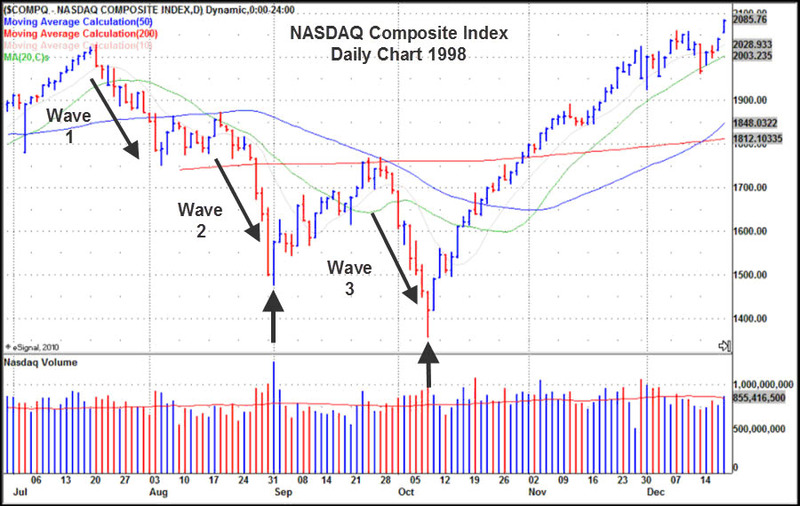 The Nasdaq made a long secular bull market from around 1982 to 2000. Just over a year before its parabolic finale it made a sharp correction that potentially signaled an end to the bull market. A technical break in a long mature uptrend with p/es having reached largely over 50. If you were trading at this point, there was an obvious case for considering this to be the end: a 16-year bull, very frothy valuations and a major technical break. Both the technical action leading into the falls and the percentage drop (in that wave 2) were similar to current gold. The Nasdaq then spent around 3 weeks gradually retracing its falls to backtest the breakdown, before a further wave of selling brought it to a new and final low. It then took off and didn’t look back, spending 18 months carving out a mania, a parabolic blow-off top. With hindsight, we might argue that the clue that the Nasdaq wasn’t done was that the uptrend up until 1998 had been fairly measured with no mania. This applies to gold now. If this the end of a K-winter with gold the leading asset, then we might expect a final mania, along the lines of the Nikkei in 1989 or gold itself in 1980. Below we see it has only made a fraction of their respective peak gains. The Nikkei in 1989, the Nasdaq in 2000 and gold in 1980 all spent a couple of months falling hard following their peaks and transition into secular bears – averaging losing 40% of their secular gains. If gold just made the final snap into a new secular bear then we should probably expect more falls to resume fairly swiftly, with more big down days. Let’s see how gold fares then this week. Everybody’s bullish on the Commodity Super Cycle. Great article. This coincides with the analog of stocks vs. gold miners of the 1920s and 30s in which in the last leg of the recovery for stocks after the 1929 crash, gold miners correlation turned negative against equities and fell hard, as we are seeing now. After equities made their highs in 1937 we saw gold miners bottom, base, then rally back to previous all time highs as stocks sold off going into WW2. I got the impression that Gold and Silver formed rounded bases and spiked peaks. This recent correction has been sharp and if Gold and Silver spike higher at some point, it’s more likely it will happen after the price has stayed at a particularl level, like it did in the summer of 2012, helping it form a rounded base. After just a week since the biggest price crash since 1983, it’s too soon for a bottom to have formed, particularly since the lows we’ve seen were caused by a sharp spike down, as opposed to a gentle grind downwards, creating the rounded base needed to make a further spike higher likely. Ref Nasdaque correction before parabolic blowoff. 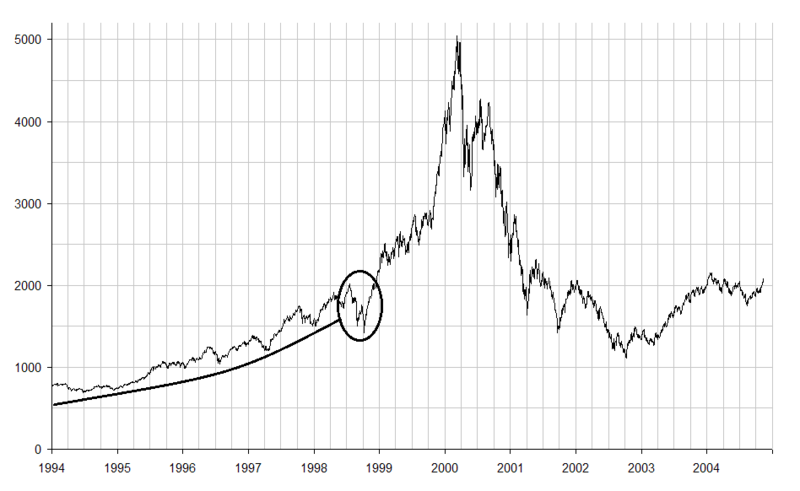 In 1998 the Nasdaq had an elliott 4 25% correction, then a 330% parabolic. In 2008 the Gold had an elliot 4 30% correction, then a 270% parabolic. So we have already had a very similar trajectory. Gold and Silver were the leaders of the commodity bull market ending in the 1980 top. Oil was the leader of the commmodity bull market leading into the 2011 top. It would be highly unusual for the same group leading in two bull markets in a row. Now forgotten mostly, the $850 in gold and $50 in silver was spectacular in 1980 even though they are very small markets. $147 in oil is even more spectacular in oil as it is a huge market. Oil fell 36% in 2006 before it’s incredible 300% rise to $147. None of these previous final corrections were as stretched out as this one in gold has been. A 25% to 36% range would be $1216 to $1425 for gold. Also since the 1933 bottom in commodities, we have have 3 major 5 counts plus several smaller ones in the last couple of year. You would be saying the correction since 2011 is a 4 of 5 of 5 of 5. That’s the problem of Elliott, we will not know until later. The new paradigm concept of peak oil, and the concept mega bull market in commodities, Malthusian Grantham, and the rock star status of Jim rogers, really makes me think it is over. Also this is a much bigger and different type of top than 1980, so the aftermath could be different. For instance, gold looks more like a distribution top than a crash top like 1980 even though it is sort of crashing now. Incidentally, the squirrelly behavior of sunspot cycle 24 and possible peaking in 2011 also adds to this thesis. What would it take to get another leg up? My thought, another 2008, deflationary collapse followed by even more printing and bailing out. I believe Congress and the FED know that would be the last thing they did, so they won’t do it, but anything is possible. More action on the crash front. The Puetz crash phase. We have lunar eclipses on 4-25 and May 25. I think that is unusal to have two right together like this. Plus the Solar eclipse is on May 25th. I hope you’re well. Some great posts recently from you and I’m finding the commodity analysis very interesting. Martin Armstrong posted some analysis over the weekend about the gold market and he’s expecting further sell offs in gold to around the $1158 level initially. Then possibly falling to $907 within the next 2 weeks. He cites that Friday’s failure to exceed the intra-day high is very bearish and so the next week or two ahead could be a little nervy for PM holders. I’m holding back on more Phys purchases in silver until we see $20 or possibly $18. I’m also hedging my positions with spread bet shorts as of last month. There seems to be something very strange yet certain about these sell-offs. Just my opinion of course. Strange times indeed. The Silver daily charts look extremely precarious! Hi, Jonathan, just have a look in your Facebook. Regards. Thanks for the post. I largely agree with your analysis about commodities falling further, as I posted myself above. I believe we could well see Gold hit $1,000 (and silver possibly hitting $16-$18) in a complete flush-out which would be healthy for any future rises, whether parabolic or otherwise. The one thing I’m positive about is that Gold and Silver will be trading at considerably higher prices in the years to come than they do know. The ‘real’ demand is mounting across the world. People are not stupid and they see what’s coming regarding this debt crisis. Regarding the Dow Index, I’m undecided and I’m generally staying away from equities. The game is being rigged and if i were to trade either way, I’d be long-biased. I’ve learned in the past never to fight the FED and those who have so far have been steam-rolled. The Dow could rise to 16,000 and beyond after a shallow pull-back. I just cannot see steep falls with all of this monetary action. Interesting, my post was removed. Just found your two comments in spam Scotty – have now approved them. I don’t remove posts – WordPress does the filtering, as you no doubt know yourself. I think those sharp 2-3 months pullbacks in ongoing bull markets are a very different thing from the now almost 2 year “correction” in gold. 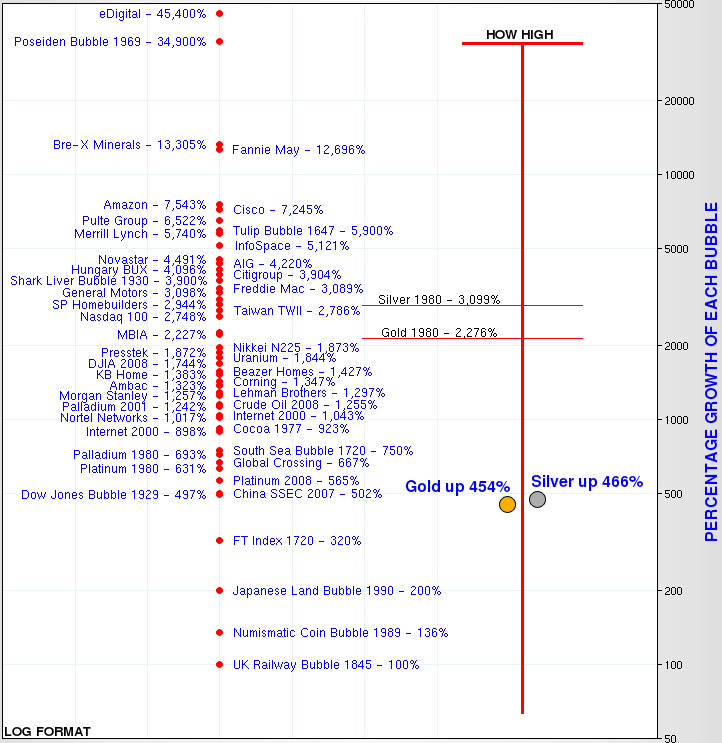 Imo, way too many analysts expect something similar to the 1980s peak in gold and subsequent 20 year bear market. That almost guarantees that something else will happen. It is called the “law of alternation”. E.g. gold could go moving sideways for the next 10 years with several rallies from $1000 to $2000, much like the stock market did in the 1970s. Thanks for your all your comments and input. Ryknow, occasionally a comment is held back pending my approval – I wasn’t around to approve it, but have done now. This did not make sense to me, but now I found your posts in spam. Gold has never been in a bubble. The word bubble is so overused these days as a scare tactic to sway markets one way or the other. On solar cycles, see a lot of climatological record correlation in US cities to year 2000. A weak La Nina year. Oh great, all GDP figures will now be really amok. Great way to distort inflation and deflation and subsequent decisions in policy. Merkel warns what several of us have spoken to before. I see this as a warning for Germany to leave the Euro. Do you know of any websites that show the price action of stocks versus gold miners from that era?